As of July 2018, EPIC and the Town of Estes Park have signed a memorandum of understanding to locate the Rocky Mountain Performing Arts Center within Stanley Park on land donated by F.O. Stanley. The town is commissioning a new Stanley Park master plan study which will include the addition of the performing arts complex, and is expected to recommend the specific siting. Once the revised master plan is reviewed and accepted, EPIC can move forward with finalizing the new design and cost estimates and will launch the capital campaign--now expected in early 2019. The EPIC board voted unanimously Nov. 21st to withdraw from negotiations for the previous proposed site in downtown Estes Park where the Park Theatre Mall burned down in 2009. Costs to secure that property became more than the project could sustain in the short and long run. Detailed review showed that nearly 25 percent of the total cost of construction at the Elkhorn location--$8 million--would involve site preparation and structures that did not directly impact the theater building itself (e.g. required utility infrastructure, River Walk improvements, and a structure to connect the theater to Elkhorn). EPIC convened a site selection committee comprised of local business, arts, and community leaders to identify a new building location. With the assistance of a local Realtor, they reviewed 26 potential locations in detail considering factors such as location and accessibility, size, cost, suitability for construction, existing infrastructure, flood plain, and social factors. Future building site within Stanley Park will be determined through the town's Stanley Park Master Plan review. Location: visible, easily accessible from downtown and Hwys 34 and 36. Proximity to Town Events Center and Fairgrounds and the potential to partner on events. The proposed theater complements existing facilities and offers a range of capabilities that do not currently exist. Similarly, the new site is within walking distance of Estes Park schools and the new community center. Lot size and the ability to include on-site parking that will also be available to augment community and Events Complex events. Access to existing infrastructure and a building location already well suited for construction, one that will not require expensive site preparation such as blasting and excavation or flood mitigation. Cost: the potential for a ground lease from the Town of Estes Park saves the project millions of dollars which in turn ensures the project is feasible, attainable, and upon construction, is sustainable. Compatibility with F.O. Stanley’s vision when he gifted the property to the community of Estes Park as a public park, recreation ground, and public entertainment. Potential to beautify the Hwy 36 entrance into Estes Park and make a statement underscoring our position as a premier mountain community, while supporting many key outcome areas identified in the Town’s 2018 strategic plan. Familiarity: locating the theater within Stanley Park is not a new idea. Earlier attempts to construct a theater were based on the Town’s offer of a one acre site at the southeast corner of the Fairgrounds and was well received by the community. This new site offers all of the advantages of that previous site with additional advantages such as visibility, room for ample parking, and a newly conceived, completely flexible theater building. Orchestral and choral music, dance, and community all come together during a 2016 holiday performance of the Oratorio Society and Ballet Renaissance on the cramped stage of the Estes Park High School auditorium. Just as F.O. 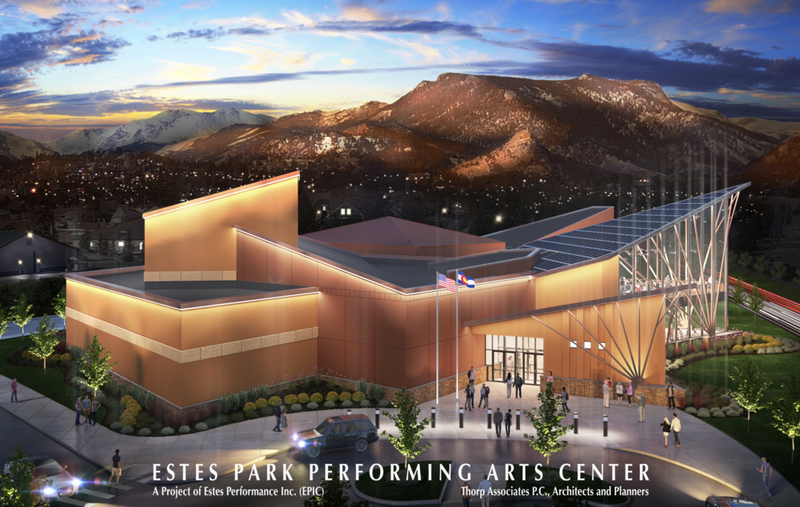 Stanley would have envisioned, the Rocky Mountain Performing Arts Center will be the cultural focal point for people who live in Estes Park year-round as well as for its millions of yearly visitors (nearly 4.5 million in 2017). The Center’s theater will be designed to adjust to the city’s annual transformation …. from a small town to the equivalent of a much larger American city. In that regard, the theater will be designed for flexibility. Throughout the year, the Center will be able to present national and international artists in a traditional theater style. And the auditorium can convert to flat floor cabaret seating near the stage. This configuration features seating and small tables. This format will also include a surrounding loge and amphitheater rear section, both with fixed seats. In this configuration, the Center will be able to present fully staged shows in a casual setting with food and beverage service at the tables. A home for the region’s artistic ensembles. For the first time, regional performance groups will have dedicated on-site rehearsal space within the Center’s facilities, and possibly even a scene shop. A partnership with Rocky Ridge Music Center offering music lessons to students of all ages. Teaching studios will be a permanent feature within the theater. Performance videos from iconic Opera, Symphonic and Dance Companies throughout the world, which include dialogs with university lecturers. A Singer-Songwriter Institute, which will bring professional mentors together with aspirants for their personal development. The National Parks have long been an inspiration for artists such as Albert Bierstadt and Ansel Adams, both of whom worked in Estes Park. The Center will feature dedicated gallery exhibition spaces. Collaborations will be sought with the Cultural Arts Council, Estes Arts District and leading regional artists. Conferences and meetings to advance the cause of the Rocky Mountain National Park and the National Parks movement. Adapting the model of the Aspen Ideas Festivalthe Center’s planning will focus on nature, the environment, and our National Parks. Partnerships will be sought with the Rocky Mountain Conservancy, the RMNP and the YMCA of the Rockies. Flexible seating enables the theater to offer numerous configurations to suit performance requirements and audience size. The theater will provide excellent acoustics and will include state of the art theater equipment and instrumentation that will expand the production boundaries of the town’s artistic companies, while meeting the highest professional needs of visiting artists and troupes. The theater will also include recording capability in the theater and throughout the teaching studios and ensemble rehearsal facilities, further widening the potential uses and revenue streams. Following construction of the performing arts center, a subsequent phase would add a small IMAX theater which would share lobby, restroom and box office facilities to add additional capability and a high return revenue stream to fund operation and maintenance costs.